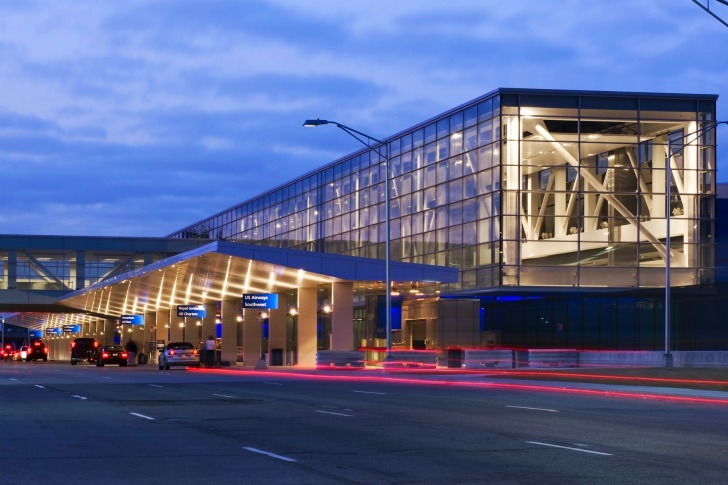 The Detroit Metropolitan Wayne County Airport is the first US airport to be designed and built after 9/11 - meaning it is one of the most modern and efficient airports out there, especially with regards to security and energy efficiency. Designed locally by Gensler's Detroit office, the linear airport features a large glass curtain wall that ushers in daylighting into the ticketing, baggage claim and security areas. The new airport also features an innovative system to service each airplane with fuel, climate control and auxiliary electricity right from the gate, in turn eliminating costly and polluting diesel-powered ground units. Detroit Metropolitan Wayne County Airport (DTW) is the twelfth busiest airport in the US. The new North Terminal replaces the Smith and Berry terminals and sits on the site of the former Davey Terminal, which was demolished in 2005. Completely designed and built after 9/11 in response to new airport security regulations under Homeland Security, Detroit’s airport represents the most modern and efficient designs in security and passenger screening for air travel. With 26 gates and 824,000-square-foot of space, DTW is designed to minimize stress associated with security screening and travel. This means more daylighting, warmer finishes, lots of electric outlets for personal electronic devices and a greater focus on views. When the old terminal and nearby hotel were demolished to make way for the new airport, much of the waste was recycled and reused. The concrete from the old buildings was crushed into gravel for use on roads and ramps, and iron and steel were recycled. All the plumbing fixtures from the old hotel were salvaged and donated to Habitat for Humanity’s resale shop. 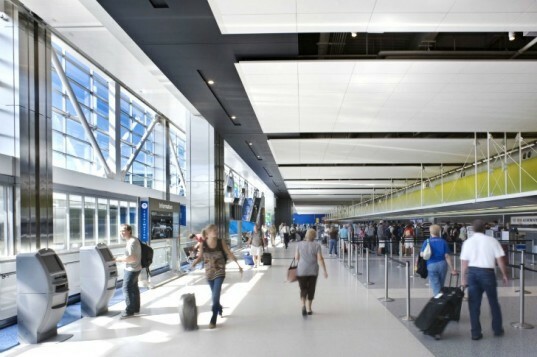 Daylighting streams in through the 660-foot-long horizontal glass curtain wall, pumping natural light into the ticketing, baggage claim and security areas. DTW was also awarded a Voluntary Airport Low Emissions (VALE) grant, totaling nearly $5.1 million by the FAA to reduce operational emissions. This grant supported construction of a system to deliver fuel, temperature-controlled air, and auxiliary electrical power directly to aircraft parked at each boarding gate. This reduces the emissions and fuel from mobile fuel trucks, auxiliary power units and diesel-powered portable ground power units. In total, the VALE grant will save the airport 418 tons of carbon monoxide, 409 tons of ozone precursors, 366 tons of nitrogen oxides, 66 tons of sulfur dioxide, 42 tons of volatile organic compounds, and 6.4 tons of particulate matter over the equipment’s 40-year lifespan. Detroit Metropolitan Wayne County Airport (DTW) was completed in 2008 and is the twelfth busiest airport in the US. The new North Terminal replaces the Smith and Berry terminals and sits on the site of the former Davey Terminal, which was demolished in 2005. Completely designed and built after 9/11 and new airport security regulations under Homeland Security, Detroit's airport represents the most modern and efficient designs in security and passenger screening for air travel. With 26 gates and 824,000-square-foot of space, DTW is designed to minimize stress associated with security screening and travel. This means more daylighting, warmer finishes, lots of electric outlets for our personal electronic devices and more focus on views. When the old terminal and nearby hotel were demolished to make way for the new airport, much of the waste was recycled or reused. The concrete from the old buildings was crushed into gravel for use on roads and ramps and iron and steel were recycled. All the plumbing fixtures from the old hotel were salvaged and donated to Habitat for Humanity's resale shop. Daylighting streams in through the 660-foot-long horizontal glass curtain wall, pumping natural light into the ticketing, baggage claim and security areas. DTW was also awarded a Voluntary Airport Low Emissions (VALE) grant, totaling nearly $5.1 million by the FAA to reduce operational emissions. This grant supported construction of a system to deliver fuel, temperature-controlled air, and auxiliary electrical power directly to aircraft parked at each boarding gate. This reduces the emissions and fuel from mobile fuel trucks, auxiliary power units and diesel-powered portable ground power units. In total, the VALE grant will save the airport 418 tons of carbon monoxide, 409 tons of ozone precursors, 366 tons of nitrogen oxides, 66 tons of sulfur dioxide, 42 tons of volatile organic compounds, and 6.4 tons of particulate matter over the equipment’s 40-year lifespan. The airport is characterized by structural steel, vivid colors and abundant natural light.